IF LITTLE Jimmy Osmond is etched in your mind as the squeaky-voiced, chubby nine-year-old, youngest-ever chart topper in the UK, think again. The boy behind the Long-Haired Lover from Liverpool is now 48 and has a few other claims to fame. 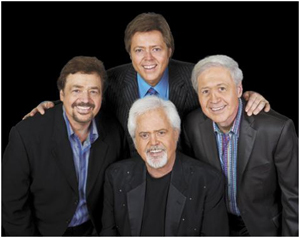 He is still the youngest of the all-singing Osmond clan, who arrive at Plymouth Pavilions on Sun. But he can look back on a remarkable career in which he and his siblings have shifted over 100 million records world wide and earned a string of honours including 51 gold and platinum awards. Jimmy is president of Osmond Entertainment and the business brain of the family. From a young age he supervised most of the Osmond's merchandising business, launching a successful advertising agency with an elite roster of clients. But he wasn't one to stay behind a desk and admits he never really knew what he wanted to do when he 'grew up'. "As I've got older I've allowed life to become more spontaneous and derived a lot of happiness that way," he says. "Hopefully I've made the most of my opportunities and mixed things up a bit." So when the offer of reality TV came along, he was not afraid to go for it. He's appeared in Celebrity Family Fortunes, Everybody Dance Now, Popstar to Opera Star and Celebrity Come Dine with Me and came second in I'm a Celebrity Get Me Out Of Here. "I had nothing to sell and nothing to lose, as I wasn't afraid to embarrass myself. I think I did OK and it was great fun. "Sometimes people like to pigeonhole you but I think they like you more if you appear as your real self. When I came out of the Jungle more opportunities surfaced, like the chance to play Billy Flynn in Chicago in the West End." No stranger to musical theatre – he has also starred in Grease, Joseph and the Amazing Technicolor Dreamcoat and Boogie Nights – Jimmy developed an unlikely love for the most British of stage shows. He has been in panto the last three years, most recently as Wishy Washy. "They are really so much fun to be a part of," he says. "In America we don't have anything like it, only the old vaudevillian tradition, but it's not the same. "It's such a great way to get into the Christmas spirit and I bring my wife and kids over for the duration. "My daughter, who is nine, appeared in the show as a bunny rabbit this time and really loved it." Of course still a priority for Jimmy is tour time with his brothers, but though they have had huge success over the years, it hasn't always been easy, as sibling rivalry has inevitably surfaced. "It was particularly hard for my older brothers when Donny came along," says Jimmy. "They were the ones who did the real hard work paving the way in the early days. If it wasn't for them there would be no Donny, Marie or Jimmy. "But they became so popular and several times the record label insisted on Donny taking the lead on songs by Meryl or Jay. Donny didn't even appear on Crazy Horses, but the label insisted on him singing it live on tour. "I guess everyone took their turn to be flavour of the month – Jay was initially the one who caught Walt Disney and Andy Williams' eye – which is when everything took off. Egos did get in the way and there were many emotional struggles, behind closed doors. It did take quite a toll. "Fortunately we were always able to keep it together though we didn't always get along. But Mom was such a positive lady. She always saw reason and could look beyond any problem. "We always knew that God loved us just the same, and consoled ourselves with the fact that most people in the limelight enjoy too much mirror time and a dose of reality never did anyone any harm. "I wouldn't trade a single day, even the bad ones." Jimmy and his brothers' Pavilions date is part – they claim – of their farewell. Expect to hear One Bad Apple, Down by The Lazy River, Let Me In, Love Me For A Reason, Crazy Horses, Long Haired Lover From Liverpool, and the rest for the last time on tour. "We truly want this tour to be a great big thank-you to our fans for their love and support through the years. We've performed in the UK many times, but this final tour will allow us to get up close and personal with our fans," says Jimmy.